In one of her JetRanger helicopters, Jo Santini is testing a new Laser Digital Communication device. In a single-prop aeroplane, Saint John is to receive the signal that Jo transmits via laser. Jo takes the helicopter through tight maneuvres which St John’s ‘plane can’t match. As she ducks down behind some trees, a deep blue beam of light shines out and hits her helicopter. I nside his aeroplane, Saint John hears Jo calling for help over the radio. Then the transmission goes dead. St John calls for his friend and searches the sky. He sees nothing – the helicopter has gone. Then the same beam of light streaks out and hits him. He struggles hard with the controls and, as he is forced into a landing, he overshoots a ravine in which lies the crash-landed helicopter of Jo Santini’s. Saint John’s forced landing is watched over by a group of men who depart a building with the “Lundahl” logo on its wall. The man who appears to be in charge directs the Sheriff towards the downed ‘plane as he attends to the other men. Saint John staggers from the ‘plane. All he can talk about is Jo’s crash but no one hears his delirious words. At the nearby Santa Mira Hospital, Dr Kingsington is in the middle of an argument with his daughter Tracey. Tracey came to Santa Mira to help her father run the hospital but is now preparing to leave because Dr Kingsington won’t abandoned his drinking in favour of saving lives. Saint John insists that Jo is the one who needs help and the Sheriff says that he’s been ranting about that all night. St John is shocked to learn that no one has begun a search for his friend. He brushes the two doctors aside and begins to get dressed. The Sheriff relents and tells Saint John that if he points the way to the crash then he will drive him there. St John agrees. 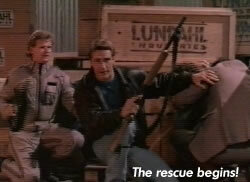 At the Lair of the Wolf, Mike and Jason return in Airwolf from a video & recon missing in the South China Seas. As Jason sends their photos back to the Company, Mike tries to contact Jo at Santini Air – he receives no response. 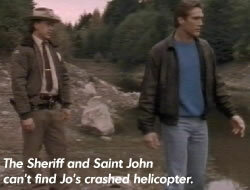 At Jo’s crash-site, Saint John and the Sheriff arrive but to Hawke’s surprise, there is no sign of Jo and there is no sign of her helicopter! The Sheriff insists that if a helicopter had crashed then someone would have noticed and reported it. He suggests that he takes Hawke back to the hospital but Saint John wants to see his aeroplane first. The Sheriff agrees. As they drive away, two men watch from the distance. Martin Lundahl is talking to the deputy. He tells him that they have a “loose end” that needs tidying up. Hawke asks to use a telephone and Lundahl points him towards a nearby office. St John makes a call to Mike at the Lair but before he can tell him where he is, he is cut off and told that new ‘phone lines are being put in and that he may not be able to make a call for over a full day. Saint John is not convinced. Lundahl tells the Sheriff that he must get St John out of the way before he learns anything. The Sheriff speaks with Dr Kingsington and tells him to make up some reason why Hawke should be confined to the hospital. Reluctantly, Kingsington agrees – the Sheriff clearly has some hold over the man. Kingsington takes a drink from his hip flask as the stress shows on his face. Back at the Lair, Mike and Jason decide to track Hawke down. They don’t have his specific location but Mike is aware that the experiment he and Jo were running would have taken them over the Santa Mira mountains. Mike hits the ‘turbos’ and Airwolf races towards Santa Mira. Hawke tries to rent a car but every used-car dealership in town is deaf to his request. He gets blocked at every turn. As he leaves the latest car dealer, Tracey Kingsington pulls up by the side of the road. Hawke convinces her that he must go back and search for Jo. He knows she is out there somewhere – hurt. Tracey agrees to help because she has suspicions of something happening in Santa Mira that her father is hiding from her. From concealment, the deputy sheriff is watching the events as Hawke discovers part of Jo’s sunglasses. On their way back to town, a car tries to violently ram Tracey’s car off the road. Hawke takes the wheel and they survive the journey – their protaganist does not! In the bar, the Sheriff is talking with the locals – most of whom want Hawke out of the way before he disturbs their way of life. Dr Kingsington does not agree as he takes another drink. The Sheriff reminds Kingsington of the man who gave him (an alcoholic doctor) and the whole town a second chance. When another man supports the doctor, Kingsington looks at him and tells them that they’ve “sold their souls” to Lundahl. Hawke walks into the bar and reports the “accident” to the Sheriff who remains casual throughout. When Hawke tells him that the other car almost killed Tracey and himself, Dr Kingsington is clearly affected. St John produces the evidence that he found and demands to know where Jo is. The Sheriff remains silent but Dr Kingsington takes Hawke and his daughter back to the hospital. 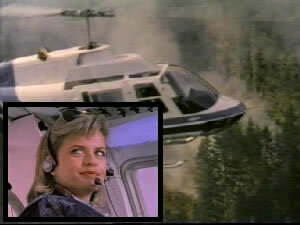 In the skies, Airwolf is having no luck until Jason uses the scanners and detects Jo’s crashed helicopter – buried in the ground. They head closer towards Santa Mira. The Sheriff reports back to Lundahl and tells him that with Hawke investigating and the doctor folding on them, their cover-up is in danger. Lundahl explains that he is in the middle of the biggest deal in his life and, within 24-hours, there will be nothing to cover-up – except their bank accounts. Approaching the town, Jason calls for information on the computers. He learns that Santa Mira turned into a regular boom town as soon as Lundahl converted the flaggin “Paint Factory” into his own Chemical Factory. In truth, according to the scanners, this “chemical fatory” is stocked to the gills with weapons! 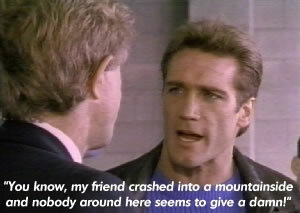 Mike takes Airwolf down. Kingsington takes Hawke into a darkened room in the hospital. The bed is occupied by the sleeping Jo Santini. He tells Hawke that he was ordered to dispose of Jo but, instead, hid her away and helped her to recover. Even now she is very bruised and her broken arm is in a sling but, as she awakens, she is able to move slowly towards Tracey’s car. Before they can reach the car, however, the Sheriff pulls up with an armed henchman. They have other plans for the people who would ruin their plans. At the Lundahl factory, Lundahl is demonstrating some of his many weapons to a group of prospective buyers. Outside, Mike sneaks by the guards and conceals himself inside. As the demonstrations continue, Jason registers the high-powered explosions on Airwolf’s scanners. Shortly, the Sheriff arrives with his prisoners. 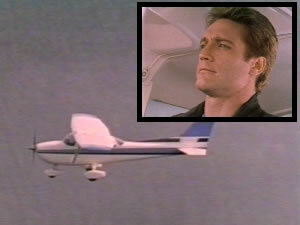 Mike reports back to Jason in the air and the two men come up with a plan of rescue. Lundahl confronts Hawke, Jo and the Kingsingtons and instructs the Sheriff to deal with them. Lundahl then takes his prospective buyers outside to demonstrate laser-sighted rifles and the laser cannon (the one that had been used to knock Jo and St John out of the sky). Mike creates a diversion and races in with all guns blazing. This gives Saint John time to over-power the Sheriff’s henchman and retrieve his gun. Mike joins him as they create enough chaos to get Jo and the Kingsingtons to safety. Lundahl reaches the laser cannon. He fires but Jason dodges the first blasts. Eventually a lucky shot hits Airwolf’s ADF-pod and the flight systems short out. Jason desperately struggles for control but realises a quick fix is in order. Opting for an unconventional manual override, Jason directs the helicopter back into the air and brings a sudden end to the laser and its owner. As the survivors clear out of the factory, Jason destroys all of the advanced weaponry left inside. Later, Jo is ready to leave the hospital properly as Saint John arrives to take her home. Tracey has decided to stay and help her father because with the destruction of Lundahl and all of his plans, Dr Kingsington has sworn off the booze for good. Barry Van Dyke excels in the first episode to feature Saint John Hawke so strongly – having previously been overshadowed by the fantastic story of Blackjack and by Michele’s unsurpassable performance as Jo Santini in Escape. This gives Barry the chance to show Saint John as the no-nonsense square-jawed hero as he seeks his friend with determination. …although not as underused as Michele Scarabelli. With the exception of the wonderful opening scene (the camaraderie between Jo and Saint John with reference back to Uncle Dom is simply magical), Jo is left to do little more than be the “damsel in distress” – complete with broken arm! – awaiting her “Knight in Shining Armour” (in this case, Saint John) to save her. This may have been down to time constraints, however, because the previous episode Escape was a 100% “Jo Santini” episode with little input from the rest of the team – maybe these episodes were filmed at the same time as each other? The story is a low-key “small town in trouble” scenario but is good for that. Without the strong espionage style plot that was popular in the fourth season, Barry Van Dyke is able to take his time and to lead the episode from start to finish. As usual, the incidental music in this episode is used to good effect – particularly through the early flying scenes. Unfortunately, whoever decided to let Jason Locke pilot Airwolf during the climactic battle-sequence must have had a serious “off-day”. Anthony Sherwood has proved himself to be well capable back at “the Company”, but just does not have the skills to make the Airwolf action scenes even remotely realistic. Who on Earth did Jason Locke believe he was talking to while Airwolf was going through its motions? Dramatic scenes do not rely on dialogue! Michele Scarabelli proved this in the previous episode when Jo Santini was on the spy mission – her face and eyes told the entire story. There are also some seriously badly edited sequences. Like Airwolfswooping through the skies – flown by Jason who is using both hands to put his helmet on! And Airwolf gets struck by the laser a few hundred feet off the ground and, while it plummets downwards out of control, Jason takes an enormous amount of time fixing the helicopter – Airwolf would have smashed into the ground if it had been 80,000 feet up! Building on the drama is good, guys, but this just comes across as ludicrous. Surprisingly enough and looking at the episode as a whole, A Town For Hire would have been a much more entertaining episode if it didn’t include Airwolf at all and just featured Barry Van Dyke and Michele Scarabelli. Michele does a wonderful job of looking cute and helpless in the hospital bed but there’s more to Jo Santini than that – as we’ve already seen and will see again in the future.